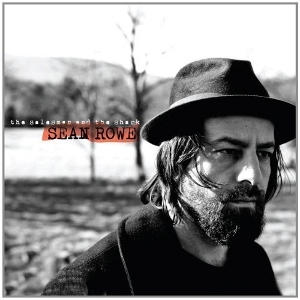 Sean Rowe is not easy to categorize, but likely would end up in the “folk/singer-songwriter” category. “Oh great,” you’re saying “another singer-songwriter? Is this really necessary?” The answer to both questions is…yes. The Salesman And The Shark is the latest from Rowe and the first new material to be published under the ANTI- banner. (ANTI– had previously re-released Rowe’s 2009 album Magic.) The combination of Rowe’s talented lyricism, strength of voice and the ANTI- label mystique (artists Wilco, Tom Waits, Neko Case, and Glen Hansard, among many other greats are in the ANTI- stable) make this one of the year’s most exciting new releases, regardless of genre. Hyperbole? Perhaps, but not by much. There is no understatement at all when the words “powerful” and “Sean Rowe” appear side-by-side. But it’s not just the voice because as you listen again, you realize Rowe is quite the wordsmith as well. The lyrics are at once smart, evocative and transformative; telling stories of pain and love that are impossible not to relate to; see, for instance, “Signs,” “Horses,” (embedded below!) or “The Ballad of Buttermilk Falls.” Rowe will hook you with his booming, resounding voice and then reel you in with fresh and beautiful stories. Once you’re caught you won’t be able to disagree that this is one of the strongest records released so far this year, and one you’ll be repeating well into the future.